University of Illinois Stamps Scholar MaryCate Most wants to use her degrees in journalism and political science to help make complicated topics around science and other issues more understandable for a wide audience. This past summer, she took one step closer to this goal while working at the Smithsonian Institution’s National Air and Space Museum. Most grew up in LaGrange Park, Illinois and went to Lyons Township high school. She developed her interest in journalism while working as the editor-in-chief of LION, the student-run newspaper. When applying to colleges, she was interested in the University of Illinois because she believed the University’s small, personal College of Media would provide the learning environment she was seeking. She said the Stamps Scholarship was influential in her college decision process because the scholarship would enable her to study abroad, to intern in Washington D.C., and to build connections with high-achieving students across the country. At the University, she has been heavily involved with The Daily Illini, the student newspaper. She first worked as a news and administration reporter. She then served as the assistant news editor, for which she reported on critical news stories, interviewed administrators, and edited stories. Her favorite issues to cover were science and research related. Some of the highlights of Most’s college journalism career are her articles on wearable microtechnology, profiles of genomic biologists, and coverage of the discovery of twisted magnetic fields around a protostar. “Writing multiple stories every week for the Daily Illini gave me an opportunity to practice concise, clear writing day in and day out,” said Most. During her sophomore year, she worked as a research assistant analyzing World Bank documents for projects taking place around the world. She examined financial management in each plan, looking for signs of fraud, corruption, and mismanagement. She developed her own independent research project studying economic, political, and environmental crises and their impacts on World Bank activities. In addition, she gave back to her community working as an awareness coordinator for Illini Fighting Hunger. She educated the community about world hunger and global inequalities, promoting change on a global scale. She tailored fundraising programs to address international and local issues, researching major causes including undernourishment and assessing possible solutions to inequalities. This included writing and delivering speeches to crowds of faculty and students and creating advertisements promoting participation in food packaging events and encouraging donations. 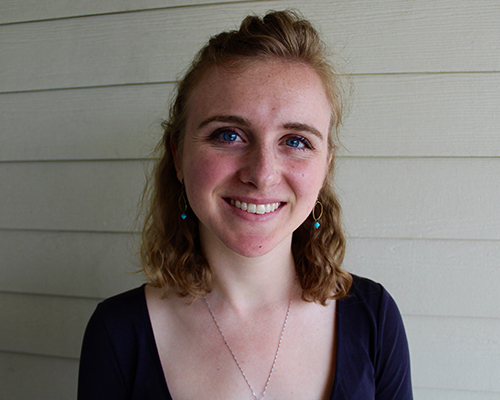 In summer of 2014, she participated in the Illinois in Washington program, which gives University of Illinois students an opportunity to obtain credit while interning in D.C. As a communications intern at The Brookings Institution, she broke down long, complex political research papers into more easily digestible summaries that were posted on The Institution’s website. Most also covered Brookings events and worked with fellows and researchers to develop media strategies. She used her social media abilities to post and analyze feedback on the Institution’s Facebook and Twitter accounts. Last summer, Most applied her research and science writing skills while working at the Smithsonian Institution’s National Air and Space Museum as a digital media intern. She wrote articles that revealed some of the greatest and often unnoticed stories of space and aviation history. Most said she was inspired to work at the Smithsonian because the institution’s dedication to public, accessible education, especially in the areas of history and science, matches her goals. Most used the Stamps enrichment fund to provide herself a global education through two study abroad trips to Belgium. She studied international politics, past and present European Union policy, and psychological impacts of the media. She said these trips were the greatest experience of her college career. “My classes there gave me insight into international politics, but I learned even more just through making friends from around the world, observing each country’s culture, and learning about the history and present state of each of the places I traveled to,” she said. During her senior year, she continued her undergraduate research with journalism professor Jennifer Follis. She served as the journalism team lead on a project with the Aerospace Engineering Satellite Development (SatDev) team funded by a NASA space grant. After graduation, Most hopes to find a career that incorporates her science writing and research skills. Working with NASA, the National Science Foundation, and the Smithsonian Institution are among a few of her dream jobs.